If I’ve already paid for something, then it is unfair to ask me to pay for it again. With the HSE referendums, those of us in the HSE school district are being asked to pay for many of the basic elements of our kids’ educations a second time. We are being asked to contribute more money when we’ve already contributed well above average. It was stated that there is a belief that HSE families live in gold plated houses and drive in luxury cars. Unfortunately that is not even close to being true. I’ve been told that the Indiana legislators believe it is fair to have HSE families contribute an above average amount to the school system and then receive less than enough money to pay their own teachers. While some people in the Fishers area might be able to dig in and pay yet again, there are many that simply can’t. They are living paycheck to paycheck just like many others in the state. The issue around referendums starts with the standard state allocations, allocations decided upon by state legislators. Let’s be clear, the HSE school system doesn’t need to get an allocation proportional to what the HSE (Fishers area) community has contributed. Nobody is asking for that even though many would consider that fair in a capitalistic society. Rather, HSE simply needs an equal allocation. The state allocation is made up of base foundation and complexity grant numbers. This total mount would currently equate to an average of $5,877 per student if distributed equally. 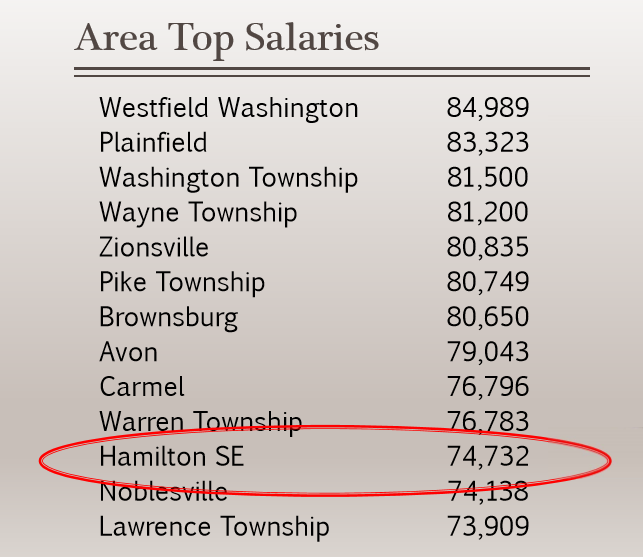 HSE currently gets around $5,176 per student, where some of the other communities are getting over $7,000. That’s nearly a $2,000 per student difference. Just a few hundred dollars can equate to millions when totaled. If the state legislators would simply give an equal allocation of funds, the $5877 per student, then HSE would not need to create a referendum. The roughly $700 difference per student would cover the gap needed to pay for the things being requested. Consider what is being asked for with this request of an equal distribution. It is not an allocation of money to be spent on extravagant features. Rather most of this money would go to core educational and administrative costs. For example, HSE currently ranks among the lowest in what it pays its teachers. When you look at teachers with experience, the pay gap for teachers in HSE quickly increases to as much as $10,000. HSE teachers don’t make $10,000 more, but rather $10,000 less. The same is true with the pay for substitute teachers. Schools like IPS have the funds to pay as much as 15% higher for substitute teachers. I don’t have numbers for the class sizes of schools within the districts getting the highest allocations, but my understanding is that the average class sizes are also smaller. The HSE Referendum is asking HSE families that have contributed above average amounts to the state fund to pay yet again to fix the above issues that were mentioned along with a few others. Alternatively, a simple adjustment to giving HSE an equal amount of the allocations would resolve the gap and allow the school system to come closer to the wages and class sizes of these other districts. Rather than paying again, we simply need the legislators to fix the allocations. How do you get legislators to fix the allocation? The initial thought would be to vote “no” to the referendum to make a point to the state and to the school board. After all, it’s the suburbs that provide the draw to get businesses to come to Indiana. Voting “no” to the referendum would be a first step to force a change. The second step would be to vote against any legislator that isn’t supporting our school systems. This includes our own district’s. Unfortunately, the school board and the state have put HSE schools into a tough position. The ramifications of what could happen during the time it takes to force changes could (would) negatively impact the operations of the schools. The result would potentially result in a very negative impact on our kids. The risk of that damage outweighs the short term gain of forcing the politicians to make the needed changes. The end result is that we have to vote ‘Yes’ to the referendum, but we don’t have to vote yes to keep the current legislators that aren’t supporting our district. Why the Yes Vote on the HSE Referendum? When it comes to the Hamilton Southeastern School’s referendum, I was not happy when I saw that the approach to creating it was not “what do we need money for” but rather “what can we ask or tell our community we want in order to get a referendum passed.” This was the common discussion at a few HSE School Board meetings last year. Topics such as moving book fees into referendum or shifting pay-to-play fees for sports were the things tossed into the early discussion by the school board. Also included were reducing class sizes and increasing teacher salaries, but those topics didn’t get any more attention than parental fees. In fact, those topics were considered a bit taboo since they were promised with the last referendum and then didn’t happen. In the end, the referendum does include things that are important for the school system. This includes money for increasing salaries for our teachers (which as I mentioned are among the lower salaries in Indiana), as well as for hiring over 40 new teaching positions. These new teachers would drop average class sizes by about 2 students. That is not much and raises other issues, but it is still a move in the right direction. 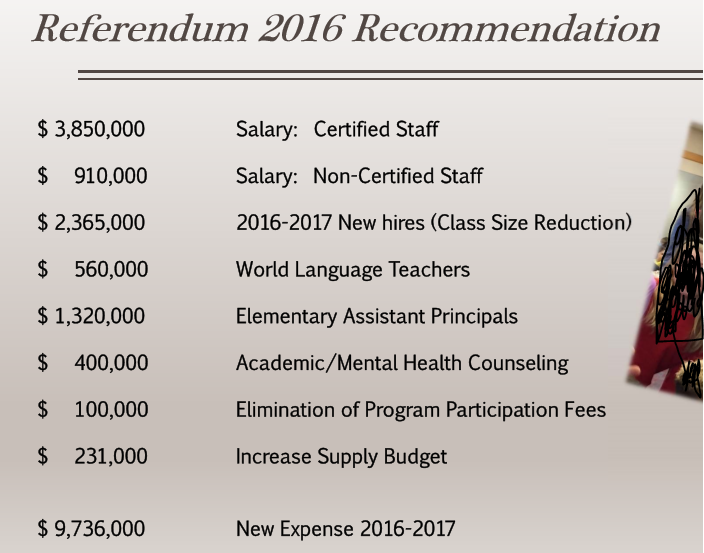 The referendum that would be approved would have a majority of the money (around $2.3 million) going to hiring or to fixing teacher salaries. There is also an allocation to bring in assistant principals in the elementary schools to provide needed administrative help. Other suggested allocations for the revenue would include nearly a million dollars to hire World Language Teachers and provide academic and mental health counseling. There are a couple of line items to also increase supply budgets and a mere $100,000 is allocated to reduce participation fees. The increased supply budget would hopefully eliminate the need for the schools to continue rationing paper near the end of the semesters. As you can see by the Referendum Recommendations in the figure, most of these requests are important. Most of these expenses are to simply help our schools do what they need to do to educate our kids and keep our districts at the level they need to be to keep our communities strong and to draw others to our community. We can’t continue to have our experienced teachers leaving because they can get $5,000 to $10,000 more in nearby districts. At a minimum, we should be able to pay equal rates to other Indiana schools. Your thought might be that we could vote “No” and simply hold tight another year or two while we force the hands of the school board and the state legislators. We could put off hiring these new positions for a year while making a point by voting down the referendum. Unfortunately, the school board has taking an all-or-none approach to asking for more money. Worse, HSE schools has a current referendum that is expiring. A 10 cent 7-year referendum was done in 2009 will end. While this existing referendum has added roughly $330 per student with the intent to reduce class sizes and fix salaries, we know that this did not happen. Rather, that referendum ended up being redirected to pay things like maintenance personnel, maintenance supplies and utility bills. In short, it pays for the daily operation of our schools. The renewal of this ten cent referendum has been combined with the asking for an additional .1275 cents. If we don’t pass the new referendum, we not only won’t get money to fund the new initiatives such as adding new teachers, but we also lose money that was paying for maintenance and utilities. The annual money coming in from the 2009 referendum goes away if it the new referendum doesn’t pass. The net result of the new referendum not passing is that the school district will lose about $7 million from its budget. The stated impact of this loss is that instead of hiring the new positions in 2016-17, HSE would instead be dropping around 50 positions next fall (this year). It was also stated that another 50 positions would likely need to be eliminated in 2017-18. The net result of losing around 100 positions would be felt in class sizes and in other areas. With many classes already stretched, the impact could be catastrophic not only on the class sizes but on the toll it would take on teachers, both those that are let go and those that remain. The ripple would be a huge impact to our families as well. What is worse, is that once this referendum is put in place, we will most likely be put into a similar position in 7 years. At that time, we will need to vote to keep the .2275 fees or face laying off up to 140 positions. If we don’t get the state legislation to fix the allocations, then referendums will keep increasing until we break the district. The belief is that people living in Hamilton County can afford to pay twice. While there are many that can afford to pay more, not everyone can. There are several people who commented to the school board at the listening tour that they struggle to find the money to pay the fees for the kids. Many families in HSE are living paycheck to paycheck. They simply don’t have the funds to cover the cost. It is our legislators that put the HSE school board and parents into this position. By adjusting the state allocations to be more even, they could resolve the difference between what is needed by HSE. It would be interesting to vote “no” and see what business like IKEA think of the results. But unfortunately, we can’t take that risk with our school system and our kids’ educations. While I can’t risk voting no for the HSE referendum, I can vote no to re-electing our local legislators who didn’t help keep us out of this position.